The ANSI 3 Reflective Bomber Jacket with Two-Tone Tape provides comfort in a striking high visibilty design. It comes with an outer jacket and a removable inner jacket. 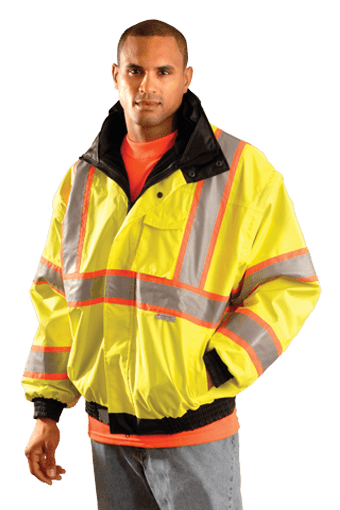 Outer jacket is made of of a weather-resistant PVC coated polyester with a nylon lining plus has removable outer jackets sleeves along with a roll-up and removable hood. Inner Jacket is made of heavyweight poly-fleece. Black waistband cuffs and collar. Two outside pockets one inside pocket and one radio pocket. 2" 3M Scotchlite® reflective tape back by orange fabric. ANSI 3 certified. Color: Hi-Vis Yellow. Sizes: S-5X.